Almond oil is a vegetable oil extracted from the almond. The almond usually refers to the fruit of the almond tree (Prunus dulcis). However, technically, almond is the seed found inside the fruit generated by this type of tree, meaning that it is inside the almond fruit that is the almond. There are two types of almond trees: those that give sweet fruits and those that give bitter fruits. Sweet almonds are mostly used in the extraction of sweet almond oil, presenting several health benefits. However, those coming from the bitter almond are more used to obtain essential oil. The oil contains fatty acids, vitamins (especially B and E), proteins and minerals (zinc, iron, calcium, magnesium, phosphorus, and potassium). It is a valuable ally for all skin types – including children, the elderly and people suffering from allergies – as well as for the hair and lips. 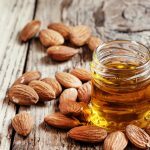 Due to the presence of nutrients such as vitamin E, B, A, folic acid and arginine, sweet almond oil brings several benefits to health and beauty, being one of the most commonly used natural products in cosmetics. It can be applied to the skin, both on the face and body, as it aids in hydration, especially for more dry areas such as knees, elbows, and feet, because it has a moisturizing and emollient property that helps in the retention of water in the skin, keeping it hydrated. It is an oil that has several uses and is great for desquamated and dry skins because, besides being easily absorbed, it helps to recover the oil balance. For this reason, people with oily skin should avoid the application of almond oil. It also helps in fighting stretch marks in pregnant women and prevents wrinkles, leaving the skin looking soft and smooth. The presence of vitamin E is responsible for the anti-inflammatory action that soothes the skin when irritated by relieving inflammation. The best way to apply almond oil is after bathing, when the pores are open, facilitating the absorption into the skin. In hair, due to its emollient properties and the presence of vitamin E, sweet almond oil helps in recovering damaged hair, dry ends and reducing the volume, nourishing and softening the hair. For those with curly hair, this vegetable oil is a great option as it helps to define them. The best way to apply it is by blending it into shampoos and hair creams so as not to look greasy. In case of desquamation, the oil of almonds must be applied pure, because the oiliness will moisturize the leather, avoiding the skin peeling. It is widely used as a massage oil because it provides a feeling of softness. In babies, almond oil can also be applied for massages, as it is a natural and hypoallergenic product, relieving cramps. If applied to the nails, it serves as a moisturizer for cuticles and fortifier, preventing them from breaking. Almond oil in its pure form also serves as a makeup remover as it does not irritate the eyes and is a great substitute for industrialized products that often cause irritation and contain chemicals that can be harmful to your health. First of all, you need to make sure the oil is suitable for consumption before you ingest it. Sweet almond oil is almost similar to olive oil in composition, it is very rich in monounsaturated fats and omega 3 fatty acids and it can be used as a good substitute in the kitchen, as it also has beneficial properties for health. It helps to maintain proper cholesterol levels and stimulates the digestive system by promoting bowel movements, being a natural laxative. Drinking a glass of warm milk with a few drops of almond oil before bed helps cleanse the bowel. It also supports energy production. However, for ingestion, make sure the almond oil should be pure.